Sir Leslie Stephen (1832-1904) was an accomplished mountaineer, writer, and magazine editor. His two marriages connected him to some of Victorian Britain’s foremost literary and artistic forces: the novel-writing Thackerays and the photographer Julia Margaret Cameron. In 1882, Stephen undertook the monumental role of editing the Dictionary of National Biography. He contributed 283 entries, among them the lives of his father, Sir James Stephen (1789-1859), and his father-in-law, William Makepeace Thackeray. 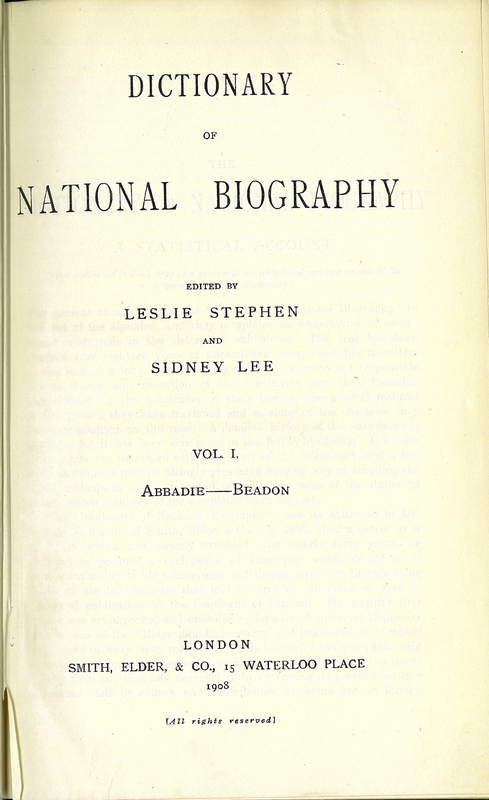 Edited by Leslie Stephen and Sidney Lee, “Dictionary of National Biography. Vol. I. Abbadie – Beadon,” ourheritage.ac.nz | OUR Heritage, accessed April 26, 2019, http://ourheritage.ac.nz/items/show/10215.